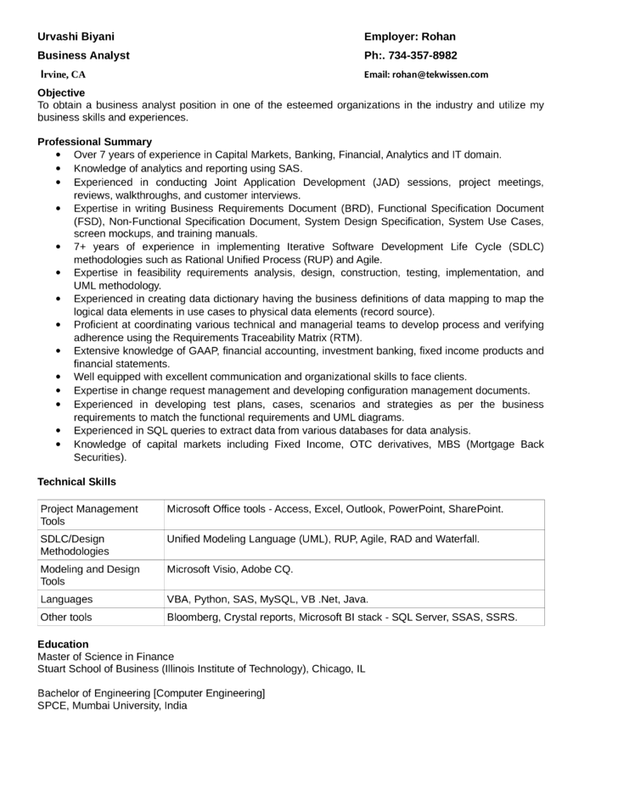  Over 7 years of experience in Capital Markets, Banking, Financial, Analytics and IT domain.  Knowledge of analytics and reporting using SAS. reviews, walkthroughs, and customer interviews. screen mockups, and training manuals. methodologies such as Rational Unified Process (RUP) and Agile. logical data elements in use cases to physical data elements (record source). adherence using the Requirements Traceability Matrix (RTM).  Well equipped with excellent communication and organizational skills to face clients.  Expertise in change request management and developing configuration management documents. requirements to match the functional requirements and UML diagrams.  Experienced in SQL queries to extract data from various databases for data analysis. Microsoft Office tools - Access, Excel, Outlook, PowerPoint, SharePoint. Unified Modeling Language (UML), RUP, Agile, RAD and Waterfall. Languages VBA, Python, SAS, MySQL, VB .Net, Java. Other tools Bloomberg, Crystal reports, Microsoft BI stack - SQL Server, SSAS, SSRS.